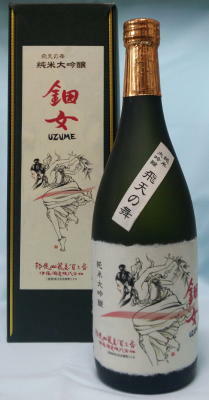 About the bottle label design: It is a portrayal of Uzume, named after Amano Uzume, a Japanese goddess. 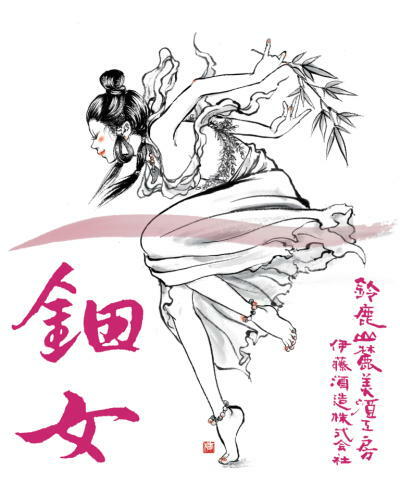 Among Japanese myths, Amano Uzume is a celestial maiden of the performing arts. She is best known for having danced for the gods to welcome Ameratsu, the goddess of the sun, upon her return after hiding in a cave. Uzume is the mother of Noh music and dance; she is also regarded as a goddess of laughter and reconciliation. Uzume is a beautiful lady wearing a celestial dress. The Uzume bottle label design was specially prepared for the Ise Shima Summit of 2016. It was drawn by Tsubaki Anna, a Ukiyo-e style artist. She designed it using a traditional Japanese ink painting technique. We use 100% the best rice for sake brewing (Yamada Nishiki rice). We use hand made traditional techniques to carefully brew pure rice junmai daiginjo and store it for a long time(over 10 years) at low temperature for aging. Gentle aroma and mellow feel, with a suitably warm lingering flavor. It is good to drink with also beef. We use 100% the best rice for sake brewing (Yamada Nishiki rice). We use hand made traditional techniques to carefully brew pure rice junmai daiginjo and store it for one year at low temperature . This is one of the offered sake at Ise-shima sumit 2016. We use 100% Mie Prefecture's unique "Kaminoho" sake brewing rice. 60% polishing ratio. We use traditional hand made techniques to carefully create pure rice ginjo sake. Slightly sweet taste, rice flavor spreads slowly and lingers in the mouth. It is good to drink cold with light taste dishes like “Sushi”. We use 100% rice grown in Mie Prefecture. 60% polishing ratio. We carefully prepare pure rice sake by hand using the traditional Yamahai Shikumi technique. We age it over a year in the brewery, for a good balance of rice flavor and sour taste. It is good to drink cold, room temperature and especially hot. IWC2017 Gold Medal.